Cobia are a prized catch of anglers on fishing charters in Naples, FL. 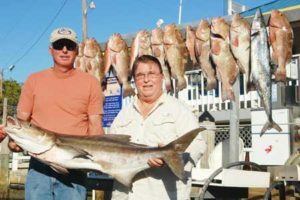 This time of year Cobia, along with many other species found in the near-shore waters of southwest Florida, are prime candidates for a great meal. Cobia are often found traveling in small groups up on the surface, where they are easily spotted. Quite often they will chase and eat a simple jig. The Alabama is available for individual and group charters!